I do not understand what I am witnessing today from your institution. This is the first time in our history we have not heard from Disney’s leader at a time like this. Enough is enough. We are family. I wrote you on 13 December 2018. Sir, I asked you in my last letter (enclosed), “do you have to wait until something worse happens to stop this hate-mongering?” Well now it has. A young member of the Scientology religious order was murdered in his Sydney church premises on January 3, 2019. This young man was stabbed in the neck and died a short while later. His murderer had been exposed to, and inspired by, the content of A&E’s Aftermath show. I thus write to you with a great sense of urgency, on behalf of the Church of Scientology and all churches and faiths, in a time when the FBI reports religious hate crimes have risen 23 percent. We live in an era in which anti-religious threats and murder are claiming lives at an alarming rate—from Mother Emanuel AME Church shooting in Charleston, in which nine innocent lives were lost, to the recent tragedy at the Tree of Life synagogue, the deadliest attack on the Jewish community in United States history. So many families and communities are left grieving in the wake of these horrific acts. I asked in my last letter that you act with courage and compassion and put an end to the hate. Yet I received no answer. The African-American community was aggrieved when they learned that you had not answered me. They felt that possibly you were slighting me. I could not persuade them otherwise as I have not heard from you. I will not be able to restrain them in their efforts to seek justice on behalf of Scientologists when it was the Church of Scientology who stood beside them through some very dark times. Other churches have been subjected to A&E’s anti-religious hate. They are also no longer safe now. March 19, 2018 – Two arson attacks at Kingdom Halls in Turnwater and Olympia, Washington State. May 15, 2018 – Thirty-five rifle shots fired into a Kingdom Hall in Yelm, Washington, causing $10,000 worth of damage. July 3, 2018 – A third arson attack destroys a Kingdom Hall in Olympia. December 7, 2018 – A fourth arson destroys the Thurston County Kingdom Hall in Washington State. 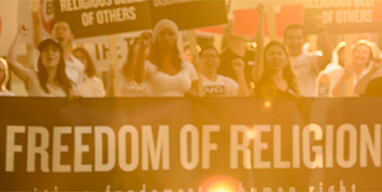 You may not be aware that A&E Networks has aired a total of seven shows which attack religion and people of faith. Sir, this is unheard of. I know of no other network broadcasting such negativity against religion, and spreading hate and lies with such vitriol and frequency. Upwards of 75 percent of the United States is religious. One has to imagine, then, that the bulk of Disney fans are religious individuals, all the more so because of the wholesome message Disney puts forth, which would attract such a viewership. In supporting attacks on religion, Disney risks alienating the majority of its fan base, not to mention its founder, himself, who was a devoted Christian. It’s a small world after all. I can only imagine he would be appalled. You may not know that I was fortunate enough to enjoy a close and warm friendship with your predecessor at the Disney Corporation, Michael D. Eisner. To say that he put priority on embracing and respecting faiths would be an understatement. By way of example, in 1997, upon discovering that the First AME Zion Church in Los Angeles had been burned to the ground, he immediately reached out and pledged to cover the costs of rebuilding. He set an example of which Walt Disney would have been proud. In 1993, when the First AME Church of Los Angeles was under bomb threat by Fourth Reich Skinheads—individuals operating on the same kind of hate which Leah Remini today spews on your network—our friends and partners from the entertainment industry circled round us, and first among them was Disney. That is the Disney we know and respect. I do not understand what I am witnessing today from your institution. This is the first time in our history we have not heard from Disney’s leader at a time like this. Enough is enough. We are family. I would like to meet with you to show you the effects of hate speech on the minds of suggestible individuals, who endanger our houses of worship and make them sites of violent crime. If you act on this understanding, you can reverse the alarming trend which Disney has been a party to, and help to bring peace and unity to our faith communities.